This artist's rendering shows NASA's New Horizons spacecraft during its flyby of Pluto and its moons on July 14, 2015. The spacecraft awoke from its final hibernation period on Dec. 6, 2014 in preparation for the epic Pluto encounter at the edge of the solar system. LAUREL, Md. — Pluto, get ready for your close-up: A NASA spacecraft has roused itself from the final slumber of its nine-year trek to the edge of the solar system, setting the stage for the first close encounter with Pluto next year. 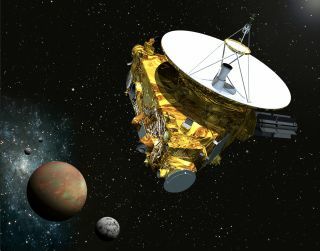 The New Horizons spacecraft, currently located 2.9 billion miles (4.6 billion kilometers) from Earth, had been in hibernation since August — with most of its systems turned off to reduce wear. But late Saturday (Dec. 6), mission scientists received a confirmation signal from New Horizons at the probe's Mission Operations Center here at the Johns Hopkins Applied Physics Laboratory. The probe is now wide awake for its 2015 flyby of Pluto. NASA's New Horizon Pluto flyby mission operations manager Alice Bowman and operations team Karl Whittenburg watch screens for signals confirming that the New Horizons probe awoke from hibernation on Dec. 6, 2014. The New Horizons mission is managed from the Johns Hopkins Applied Physics Laboratory in Laurel, Maryland. First word from the probe arrived at about 9:30 p.m. EST on Saturday (Dec. 6) — generating a burst of happy applause from the attendees, including Alan Stern, New Horizon's principle investigator, and Jim Green, NASA's director of planetary sciences. At 9:52 p.m. EST (0252 GMT), mission managers confirmed that New Horizons was awake, with all systems functioning normally. The wakeup sets the stage for the probe's flyby of Pluto on July 14, 2015. "This is the turning of a page. This is changing from a mission in cruise to a mission at its destination," said Stern, of the Southwest Research Institute in Boulder, Colorado. Stern popped a champagne bottle and offered a toast to the mission following the signal confirmation. New Horizons even got a wakeup song to mark the occasion: the tune "Where My Heart Will Take Me" by English tenor Russell Watson. The song, which included a special greeting from Watson for New Horizons, was played in the mission operations center after the confirmation signal was received. You can hear Watson's New Horizons wakeup song here. This photo of Pluto (center) and its largest moon Charon was captured by NASA's New Horizons spacecraft in July 2014 and released on Aug. 7. New Horizons took this image and others from a range of 267 million to 262 million miles (429 million to 422 million kilometers). English tenor Russell Watson recorded a special version of his song "Where My Heart Will Take Me" to help wake up NASA's New Horizons spacecraft on Dec. 6, 2014 ahead of the probe's 2015 Pluto flyby. New Horizons will begin its Pluto science campaign in January, and will make its closest approach to Pluto in July. It will explore the outer-most and most-populated region of the solar system, the Kuiper belt, which is full of rocky, icy objects that have remained largely unchanged since the formation of the solar system. "This is the place that this spacecraft was built to operate, and these are the operations that this team has waited a decade to actually go and execute," Stern said. "So it's game time." NASA launched the New Horizons mission in 2006 on a $700 million mission to be the first spacecraft ever to see Pluto and its five moons up close. The piano-size spacecraft is powered by a nuclear power source and has traveled nearly 3 billion miles (4.8 billion km) to reach Pluto in a mere nine years, making it the fastest space probe ever launched). It has spent two-thirds of its journey in a hibernation state that has both prolonged the life of the instruments and reduced staff costs on the ground. While New Horizons has gone through 18 hibernation periods, sleeping for about 1,873 days in all, this is the last one before it begins taking data on the Pluto system. For 20 weeks of its flyby of Pluto, New Horizons will provide better photos of Pluto and its moons than those taken by the Hubble Space Telescope, Stern said. In analogy, if the spacecraft were flying over a city it would be able to count the individual buildings on the ground. New Horizons may also identify as-yet-unknown moons or rings around Pluto. At the wake-up event, Stern handed out small, 2-inch-long pencils — whittled down from extensive use. "This is the metaphor for persistence," Stern said, holding up the pencil stub. "Since this mission went through so many ups and downs — the way the exploration of Pluto did — I thought this was an appropriate thing to give away. It's very simple, but it's meaningful."